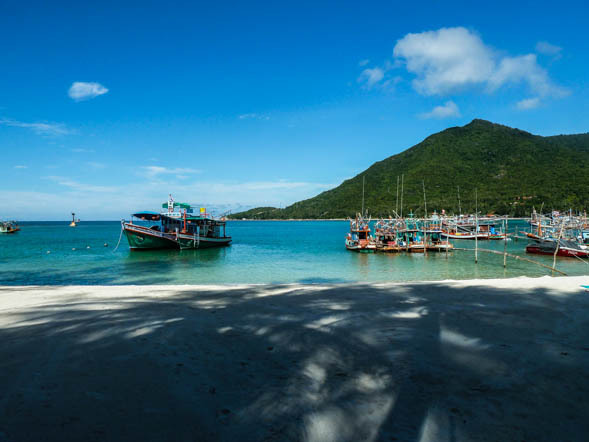 Koh Phangan is mostly famous for the notorious full moon parties. Every month young people travel to Had Rin to wear some fluorescent clothes, dance to bad techno music, drink some mushroom shakes and get totally drunk on buckets of cheap alcohol. I have done two full moon parties in the last couple of years and, I must say, I didn’t really like it that much. Especially, being a single girl in a crowd of overenthusiastic men was not something I enjoyed. 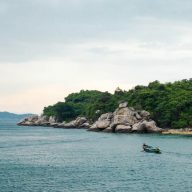 This month I went to Koh Phangan outside of the ‘full moon season’. I wanted to party a little and I was also planning on catching up on some sleep and see other places on the island. I stayed near Had Rin beach, where all the parties happen. During the day it is pleasant enough with blue water and clean sand, but I craved something even more chilled out. 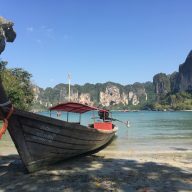 So, one day I took a scooter, drove around the island and found amazing places. 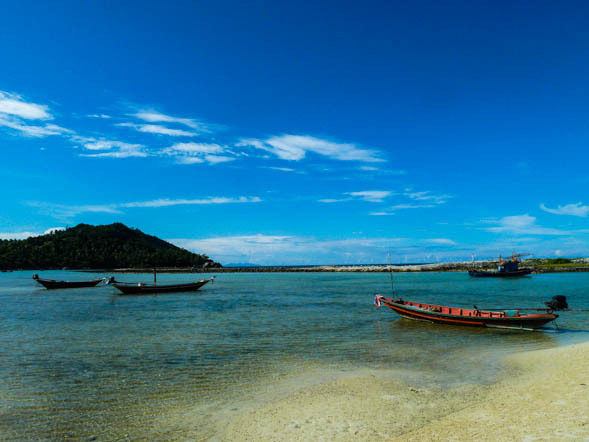 These are the best beaches on Koh Phangan. I had heard about this beach a couple of times before. 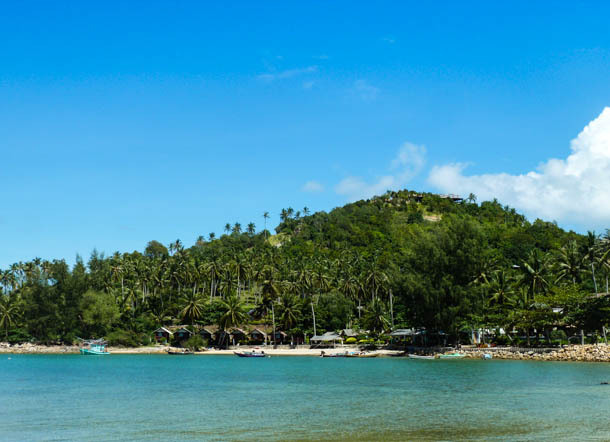 Every time I went to Koh Phangan I planned on visiting it, but it never quite worked out. This time I finally made it and I was totally blown away by its beauty. 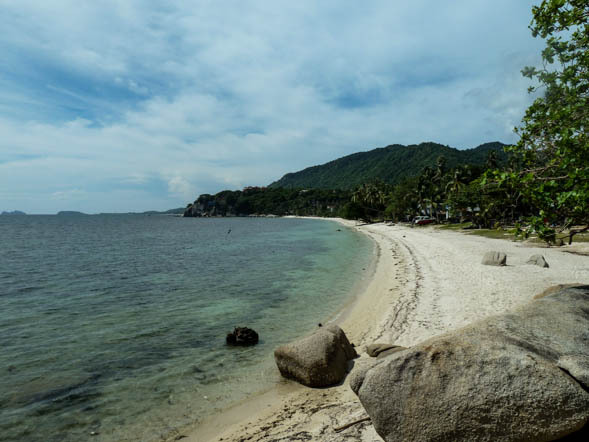 In my opinion it is the best beach on Koh Phangan. It is surrounded by green hills and palm trees, which give quite a lot of shade during the day to those, who don’t like to stay on the sun for too long. At the far end grow characteristic small trees, which can only be seen here. The beach has crystal blue water and sand so soft it is hard to believe that it is not flour. The hills, the colourful fishing boats, blue water and the white sand make this beach look almost surreal. Just look at the photos I took that day! There is at least one resort in the area and 2 small bars with drinks and food. Well, it’s not really that secret since there are a couple of signs pointing to it from the road. Still, this beach is quiet with just a couple of people soaking up the sun. The water at the shore is very blue and makes a beautiful contrast to the water a bit further, which is dark from the growing algae. There is a small bar, where you can have western and Thai food, and drink some beer. 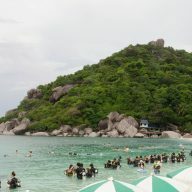 They also organize sightseeing, diving and snorkelling trips. If you are staying in Had Rin, this beach would be the easiest to get to. It is only around 5 minutes walk from the town centre. 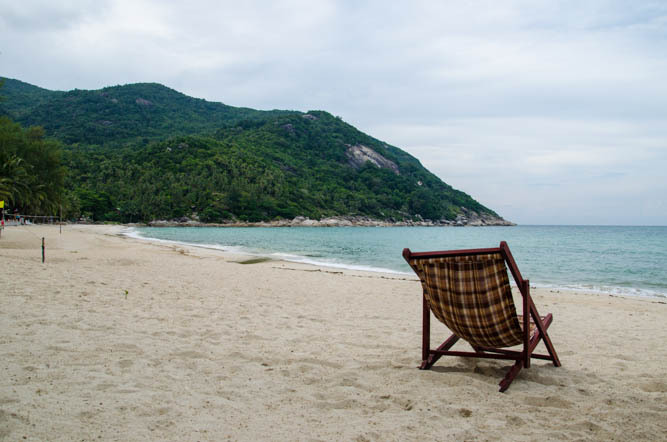 The beach is lined up with bungalows and small, quiet bars, but even during the busiest times it is not overcrowded and you can always find a nice, isolated spot. 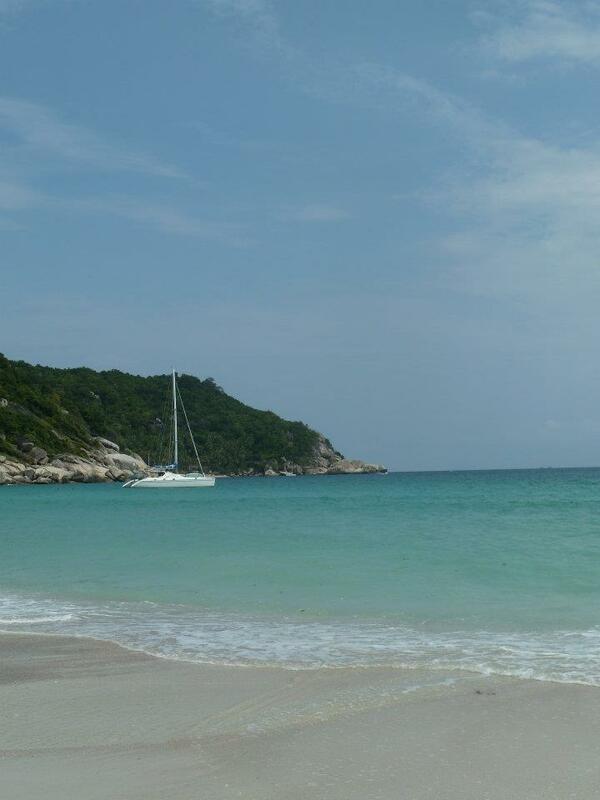 Many say that it is the best beach on Koh Phangan. It was also the first place I visited on the island. It is very popular among young families and couples, so if you are single, or want to really get some rest from talking to backpackers and travellers, this could be your number one choice. Had Salad is especially pleasant during the night, when the little bars and restaurants put on their pretty lights and play quiet chilled out music. To get there you need to get to Chaloklum and hire a boat. Apparently you can also trek there through the jungle, but who would want to do that if you can have a nice boat ride with beautiful views. I wasn’t very lucky with the weather. It was cloudy and a little cold so the pictures don’t give justice to the beauty of the place. 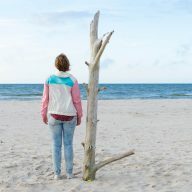 There are a couple of places to stay and eat, but it is a very quiet beach, away from all the other amusements, so be aware of that before you decide to stay here. Otherwise, you can come here for a day trip. The cheapest way is to hire a scooter (250 Baht per day) and drive to Chaloklum. 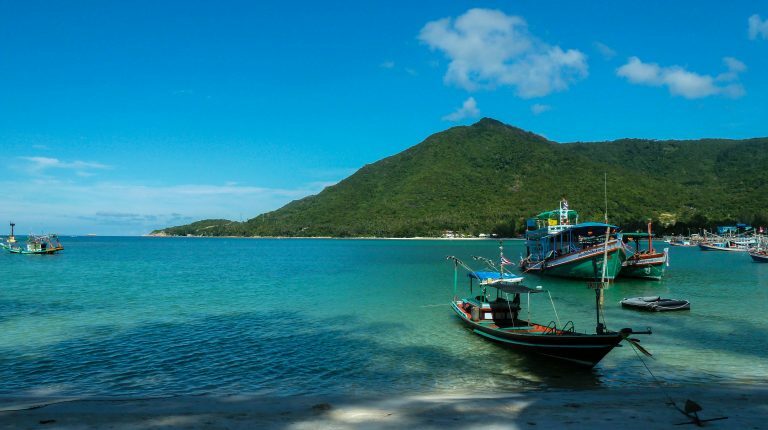 The boat will cost around 200 Baht per person one way. It is a popular tourist attraction and it can get a little crowded during the high season, that’s why I mention it as the last one. 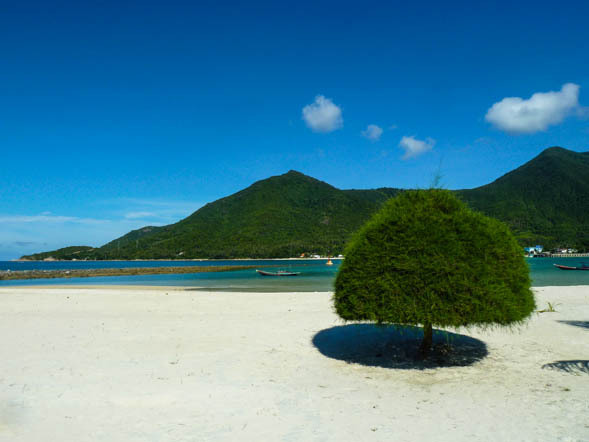 It is famous because you can walk through a white strip of sand from the beach to the small island. Its main part has a very ‘grainy’ sand, which makes it painful to walk, so going swimming is not that pleasant. It is better to walk up to the island a little to enjoy the water. I wanted to add this little piece of information as I cannot praise the Yoghurt Home 3 enough for its peacefulness, friendliness of staff and a great location. I always stay there and it’s a place that hasn’t been discovered by many. The bungalows are clean and spacious, equipped with air conditioning, warm water and each has a private balcony, which is hidden away from the street view. Plus, it’s only a few seconds walk from the main beach. Yoghurt Home is located in Had Rin, so if you are coming to Koh Phangan during the full moon and you don’t want to party, then it’s probably not the best place for you to stay. However, outside of the craziness it’s ideal for those looking for some peace and quiet.